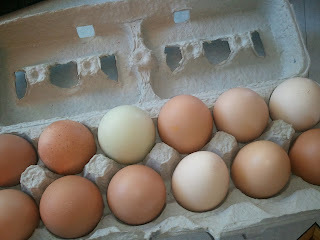 There is something so wonderful about farm-fresh eggs. We get ours at Black Hills Milk which is located in the same lot as Crow Peak Brewing Company in Spearfish. The difference is clear. All you need to do is compare the color of the yolks. The yolk should be bright yellow or sometimes, even orange. Now, open up the eggs you just bought from the stack of 100 dozen eggs at Safeway or Wal-mart and crack one open. Lemon yellow yolks will await you. You can find local eggs at your local farmer's market and if there isn't one open over the winter, ask around because there is probably someone that has eggs to sell. For those of you in Spearfish, head over to Black Hills Milk and support this great local business. They are open from Monday - Saturday, 11am - 6pm and offer grass fed / finished beef, raw milk, a great selection of cheeses, produce, homemade bakery items, jellies / jams and all sorts of good things. Shop local - it's a GREAT idea!